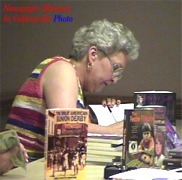 Author Molly Griffis signed copies of her latest book, "The Great Bunion Derby" at the Collinsville Library Saturday, July 12, 2003. 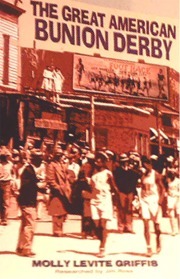 The book is about a 1928 foot race from Los Angles to New York City won by Oklahoman Andy Payne. 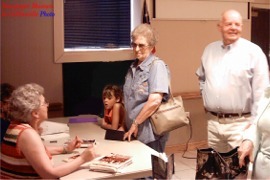 Several members of Andy Payne's family attended the book signing, including his sister-in-law Doris Payne and her son shown in the photo above. 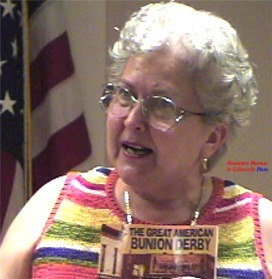 Griffis spoke to a group of more than 50 and told her "story" and described how she came to write this book and several others books she has written. 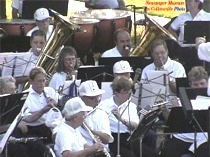 For more information visit her website: www.mollygriffis.com. 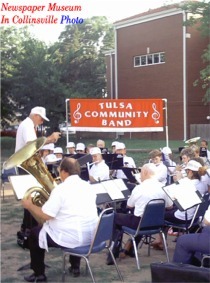 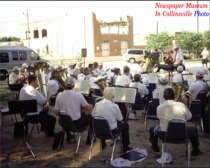 The Tulsa Community Band presented an old fashioned concert on the East side of the Library lawn Saturday evening July 12th.